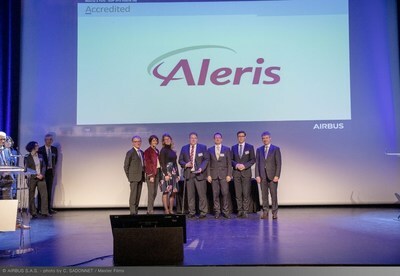 CLEVELAND, March 25, 2019 /PRNewswire/ -- Aleris has been recognized for the second consecutive year with the accredited supplier award by Airbus at their Supply Chain and Quality Improvement Program (SQIP) event in Toulouse, France. A global leader in aluminum rolled products, Aleris was recognized in the Accredited Supplier category, fulfilling the maximum requirements for excellence. "We are proud to have achieved the status of Accredited Supplier for 2018, the highest supplier distinction, for the second time," says Dr. Ingo Kröpfl, Aleris vice president Global Aerospace. "We will continue to work even harder to maintain this level of performance." Aleris' performance and continuous improvement was honored in 2015 and 2016 with the Best Performer Award, followed by the Accredited Supplier status for 2017 and 2018. Aleris supplies plates, sheets and cut shapes made of certified aluminum alloys, which are then used to make components for Airbus aircraft. The Accredited Supplier award also recognizes the successful ramp-up of Aleris' manufacturing plant in Zhenjiang, China. The global aircraft manufacturer works with more than 12,000 suppliers worldwide and since 2012 has been rewarding the industrial excellence of companies and subcontractors that form part of the supply chain through the SQIP program. Aleris is a privately held, global leader in aluminum rolled products serving diverse industries including aerospace, automotive, building and construction, commercial transportation and industrial manufacturing. Headquartered in Cleveland, Ohio, Aleris operates production facilities in North America, Europe and Asia. For more information, visit www.aleris.com. Certain statements contained in this press release are "forward-looking statements" within the meaning of the federal securities laws. Statements under headings with "Outlook" in the title and statements about the Merger and our beliefs and expectations and statements containing the words "may," "could," "would," "should," "will," "believe," "expect," "anticipate," "plan," "estimate," "target," "project," "look forward to," "intend" and similar expressions intended to connote future events and circumstances constitute forward-looking statements. Forward-looking statements include statements about, among other things, future costs and prices of commodities, production volumes, industry trends, anticipated cost savings, anticipated benefits from new products, facilities, acquisitions or divestitures, projected results of operations, achievement of production efficiencies, capacity expansions, future prices and demand for our products and estimated cash flows and sufficiency of cash flows to fund operations, capital expenditures and debt service obligations, as well as statements regarding trade cases, tariffs and other future governmental actions. Forward-looking statements involve known and unknown risks and uncertainties, which could cause actual results to differ materially from those contained in or implied by any forward-looking statement. Important factors that could cause actual results to differ materially from the forward-looking statements include, but are not limited to, the following: (1) our ability to successfully implement our business strategy; (2) the success of past and future acquisitions or divestitures; (3) the cyclical nature of the aluminum industry, material adverse changes in the aluminum industry or our end-uses, such as global and regional supply and demand conditions for aluminum and aluminum products, and changes in our customers' industries; (4) increases in the cost, or limited availability, of raw materials and energy; (5) our ability to enter into effective metal, energy and other commodity derivatives or arrangements with customers to manage effectively our exposure to commodity price fluctuations and changes in the pricing of metals, especially London Metal Exchange-based aluminum prices; (6) our ability to generate sufficient cash flows to fund our operations and capital expenditure requirements and to meet our debt obligations; (7) competitor pricing activity, competition of aluminum with alternative materials and the general impact of competition in the industry end-uses we serve; (8) our ability to retain the services of certain members of our management; (9) the loss of order volumes from any of our largest customers; (10) our ability to retain customers, a substantial number of whom do not have long-term contractual arrangements with us; (11) risks of investing in and conducting operations on a global basis, including political, social, economic, currency and regulatory factors; (12) variability in general economic or political conditions on a global or regional basis; (13) current environmental liabilities and the cost of compliance with and liabilities under health and safety laws; (14) labor relations (i.e., disruptions, strikes or work stoppages) and labor costs; (15) our internal controls over financial reporting and our disclosure controls and procedures may not prevent all possible errors that could occur; (16) our levels of indebtedness and debt service obligations, including changes in our credit ratings, material increases in our cost of borrowing or the failure of financial institutions to fulfill their commitments to us under committed facilities; (17) our ability to access credit or capital markets; (18) the possibility that we may incur additional indebtedness in the future; (19) limitations on operating our business and incurring additional indebtedness as a result of covenant restrictions under our indebtedness, and our ability to pay amounts due under our outstanding indebtedness; (20) risks related to the Merger, including the possibility that the Merger may not be consummated; and (21) other factors discussed in our filings with the Securities and Exchange Commission, including the sections entitled "Risk Factors" contained therein. Investors, potential investors and other readers are urged to consider these factors carefully in evaluating the forward-looking statements and are cautioned not to place undue reliance on such forward-looking statements. We undertake no obligation to publicly update or revise any forward-looking statements, whether in response to new information, futures events or otherwise, except as otherwise required by law.